...due to the lack of detailed technical analyses, the inability of the State’s Project Director to deliver promises made during this planning process and the insufficiency of mitigation to ameliorate anticipated negative impacts on both residential and commercial properties and therefore the citizens of the City itself, I am prevented from fully embracing the project as proposed at this time. He then goes on to echo that he welcomes the Green Line extension and dives right into the meat of his comment, namely the weakness of the original Draft Environmental Impact Report with respect to the extension beyond the College Avenue stop to the Mystic Valley Parkway in Medford. Additional concerns he raises echo those of so many others who have also commented on the DEIR since its public release: property acquisition and resident relocation; parking, auto accessibility, and traffic management around stations; construction effects on residents; stormwater management; and the location of a controversial storage and maintenance facility much like those located at Riverside and Resevoir. Parts of the letter come off as yet another politician succumbing to the now vogue practice of crying NIMBY about transit and rail projects and allowing concerns about construction disturbances to overshadow the overall benefit these projects provide. Admittedly, this transit project serves and benefits the communities through which it runs more directly than high speed rail (which isn't to say both aren't worthwhile economic capital investments). Concerns about cost overruns and construction delays don't come from nowhere, though - a national epidemic has broken out with large capital projects and threatens to prove once and for all that America has lost not only its vision to dream big, but to also invest in projects that contribute to the long-term vitality and competitiveness of our neighbourhoods. Mayor Glynn strikes right at the matter, which is that the Commonwealth needs to evaluate the extension as a whole and through the Executive Office of Energy and Environmental Affairs puts pressure on MassDOT to face the project as a single component. Documents at the Green Line Extension web site and representatives from MassDOT on the project have repeatedly stressed at public hearings and various meetings that the extension beyond College Avenue is considered another phase of the project and is conditional upon the acquisition of additional funding for the project. However, it's clear that residents of Medford (or at least the politicians) want a clear shot at benefiting from this extension and further gaining assurance from MassDOT that adverse impacts will be minimal, or in the very least considered and addressed. While this publicized move by the mayor of Medford may secure him votes for the next round of elections, his objective - and that of the residents of Medford - must not obscure the fact that the extension through his town is contingent upon additional funding - funding MassDOT does not have and may be reluctant to provide, given its history of road funding favouritism. For decades since the advent of the Eisenhower interstate system, municipal, state, and the federal governments have disinvested from transit and today, more than ever, subsidize road and air travel. Meanwhile, it has become politically vogue to expect transit and rail to be financially self-sufficient. This is a national issue about the (im)balance of transportation funding playing out right in our back yard. 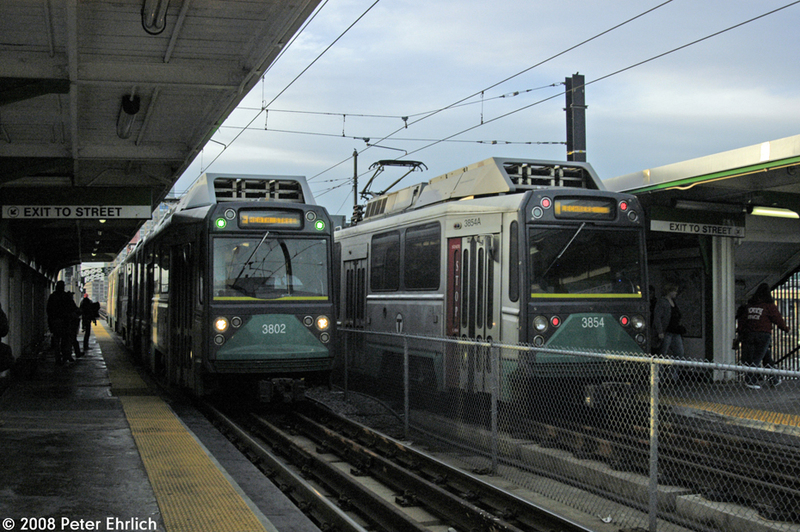 Transit expansion has become vogue in many parts of the country and part of it has to do with cities waking up to the realities about transit's affect on economic vitality. The residents of Medford need to look beyond the DEIR and Final Environmental Impact Report at the funding issue that encompasses their concerns about what appears to be a half-baked plan for an extension further into their town. Perhaps even more unfortunate for Medford residents than the project's dependency on additional funds is that the alignment of the Green Line extension takes it nowhere near Medford Square, the more pedestrian center of Medford that has a greater potential to develop rapidly as a transit-oriented area than the Mystic Valley Parkway dead-end, which is closer by foot to a U-Haul storage facility, a retirement home, and lots of parking. I don't have any politically safe answers to balancing the budget, nor securing the funds for this extension other than through a request for a federal grant, but I do know that if Medford residents want their share of this extension, they'd better act fast to not only put pressure on MassDOT to complete a FEIR that includes full technical details for it, but also to actively seek means to secure the necessary funding because transit is on the line.